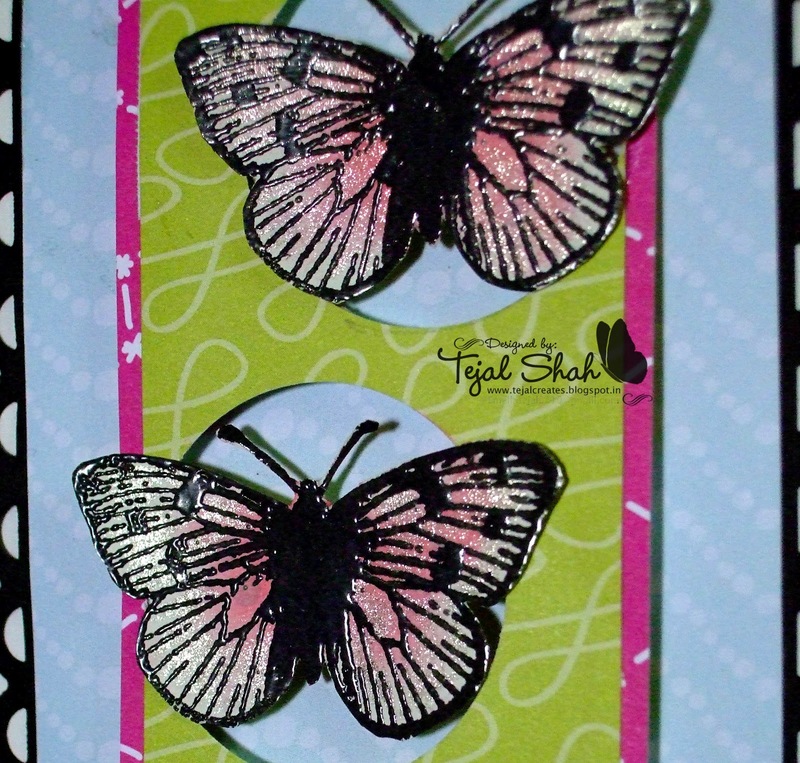 Hello ... Tejal here to entice you with some butterflies!! 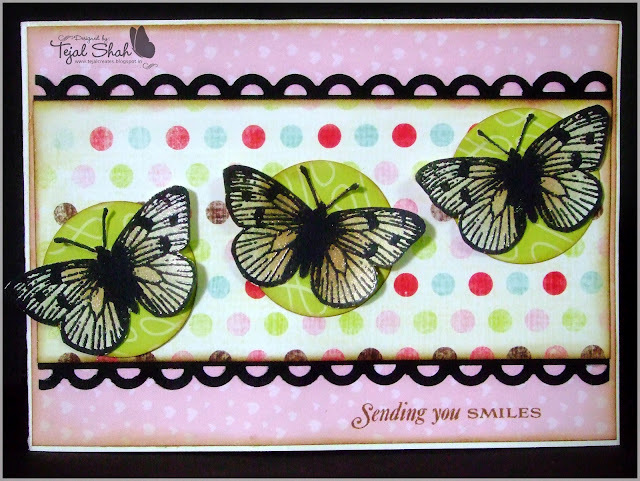 Some may call me crazy, some may call me mad, but my obsession with butterflies isn't likely to die...neither in my stamps nor on my cards....so don't say I didn't warn you! :) Without butterflies or bling, my card never seems complete!! So what have I got for you today? I've got not one but two cards....Both have the same sketch to it, one is horizontal and one is vertical. I had this sketch bookmarked for a very long time in my book....its a card by Lucy Abrams..She's a genius that girl!! Now when I see the card, I see the middle panel is leaning off to one side!! DARN!! Those are some amazing papers from American craft's Hello sunshine collection! 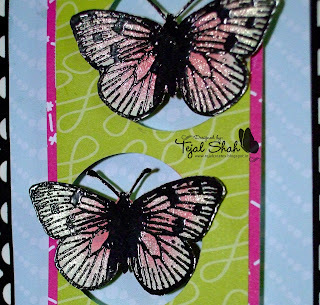 The ones I've used are Glow and Spree , The butterflies are from Hero Arts (Antique Engravings) and embossed with Versamark and Black EP(American Crafts Zing) and colored with Worn lipstick using Foam Daubers from Ranger. TIP - Do you see the pink strip along the green panel? Its the half inch strip that is at the bottom of your CS/PP where the name of the company is usually written...YES! I hoard those strips too...since usually they're in contrasting colors! 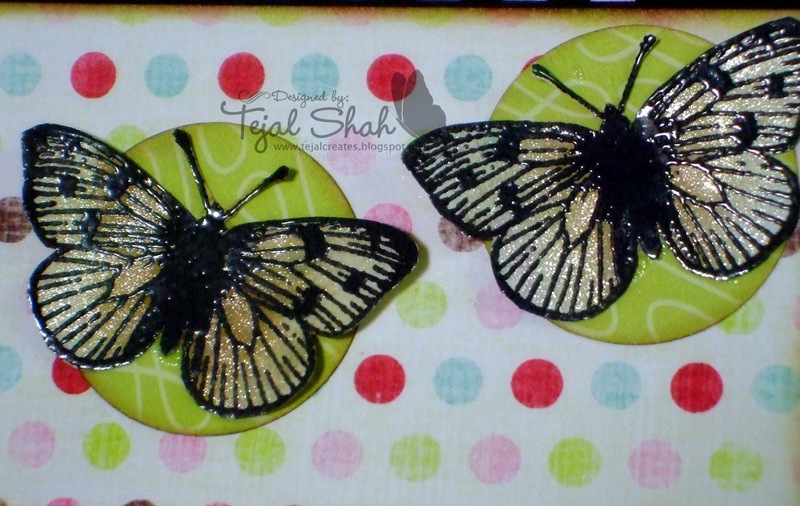 Can you see the faint sheen of shimmer on the butterflies? Its the Stardust pen from Sakura...just enough bling..not too much! Sentiment again from PTI - Simple sunflowers. Some more bling on the fluttering wings!! There's lots more in the Lulupu store...and new products are being added everyday....Register at the store and receive regular updates when new products get added! and The Pink Elephant - To use butterflies! and a very Good Afternoon to all of you... Hope you are enjoying a relaxed Sunny Sunday!!! It's gotten quite warm out here and feels like almost spring!!! Meet today's Card... Well, actually a Tag!!! Manilla Tag, HA 3 Dotted Flower, Laces, Punchinella, Ribbon, Hat pins(a rak fm Tejal), Stampendous yellow embossing powder, Versamark, Heat Gun, Twine and Rhinestone. 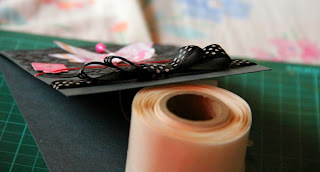 The Punchinella background is totally inspired by Yvonne and her innovative use of off beat materials. The best part about double sided sheets in a pack is that the colors coordinate with each other really well and that really cuts down the botheration of finding the right shades that go together. 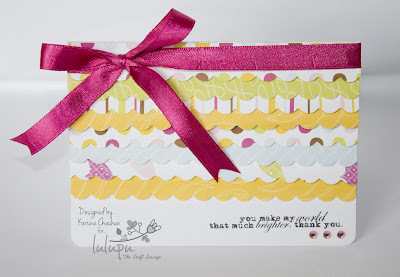 For this yummy paper collection and many such more stuff head over straight to the Lulupu Store now. Hello people!!! 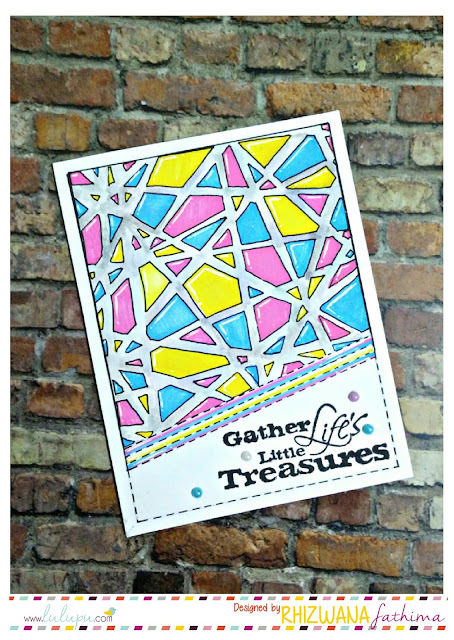 This is Nikita here with another card using the fabulous patterned papers (and more) from the Lulupu Store. 2. Did you see the fab tutorial by Shruti?? Did you know it was that easy to create a three-layered bow?? If you haven't you can check it out here! But when I tried it on another piece of cardstock (the one that made it to the final card,) it was way better than my first try (even though my actual first try was on a piece of scrap paper, and THAT was perfect; can you believe that???) It's not perfect on the final card, but it's manageable. Apart from the Sew Easy tool, I have used the Stamp Press, the Corner Chomper, the Cuttlebug, and many other tools. 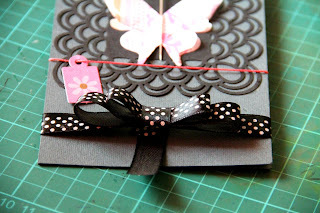 Now, one thing I learned while making this card is that, even though Twine is a great embellishment and looks wonderful when just tied around cards in bows, it's not that great for stitching, and let me tell you why. It's because the whole running and being pulled through the holes on the paper make the threads un-twine. So if you notice the stitch lines on the top and bottom of the card (especially the bottom), you will see that when the stitches start off from the left, you can see both red and white threads tightly wound up together.But as the stitch progresses towards the right, the threads become loose. And finally, here's the list of Supplies!! 2. Patterned Paper - Fancy Pants- Sprinkles - Wishful Thinking Double-Sided Paper 12"X12"
12. Twine - Doodlebug Design Inc.
See you all next time!! Happy Crafting!! Whats cooking crafters?? This is Shruti here and I am back with yet another card for Lulupu. Today's card was supposed to be a CAS card.. but like always whenever I sit down make one I land up adding more and more elements to it.. and it turns out to be anything but a Clean and a Simple card. I guess I have had enough of trying to do something I am not good at. So, I have decided to take a chill pill and just sit back and enjoy watching the CAS gurus, like our very own Tejal, swing their magic wand..
Anyhoo without digressing anymore.. 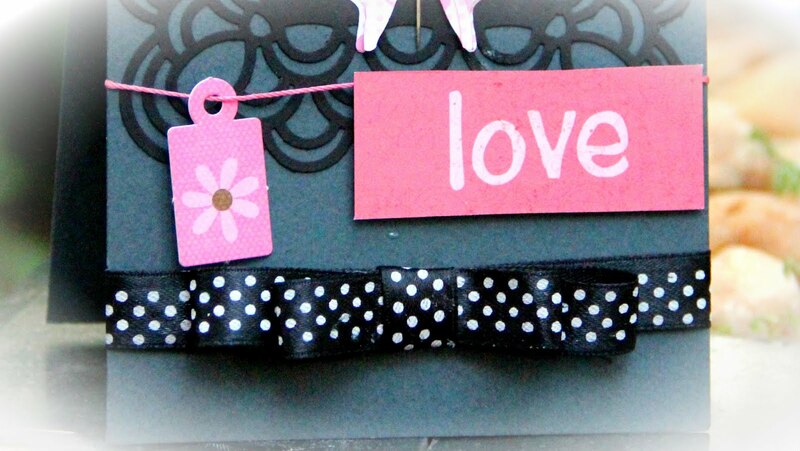 Here is what I have for you today..
Ribbon, scissors, glue dots and an exacto knife to pick the glue dots. Measure the width of your card and cut the ribbons accordingly. 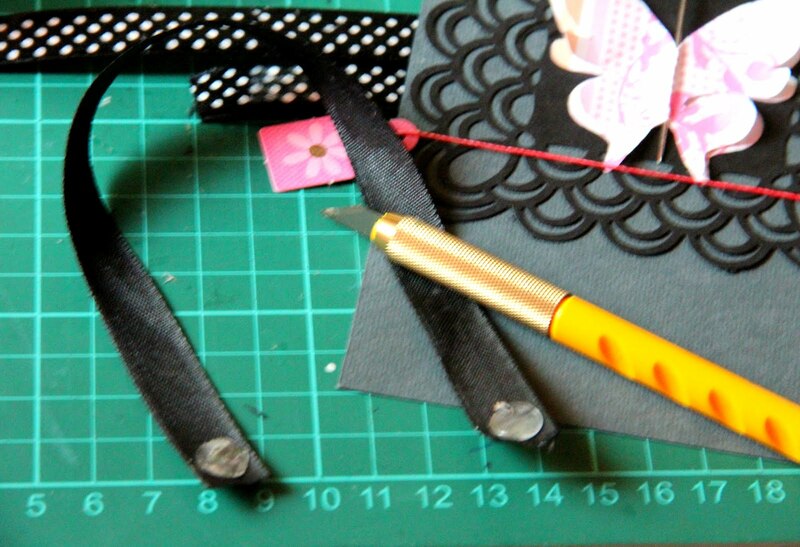 I have a 24 cm, 18 cm, 12 cm and a 5 cm long ribbons cut and arranged. 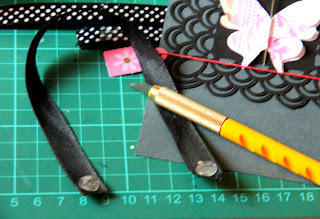 Now take the longest ribbon and adhere the glue dots on the both the tips of the ribbon like I am demonstrating in the picture. Note: the glue dots are to be placed on the back side of the ribbon. Now tie it around the card like I've done in the picture. 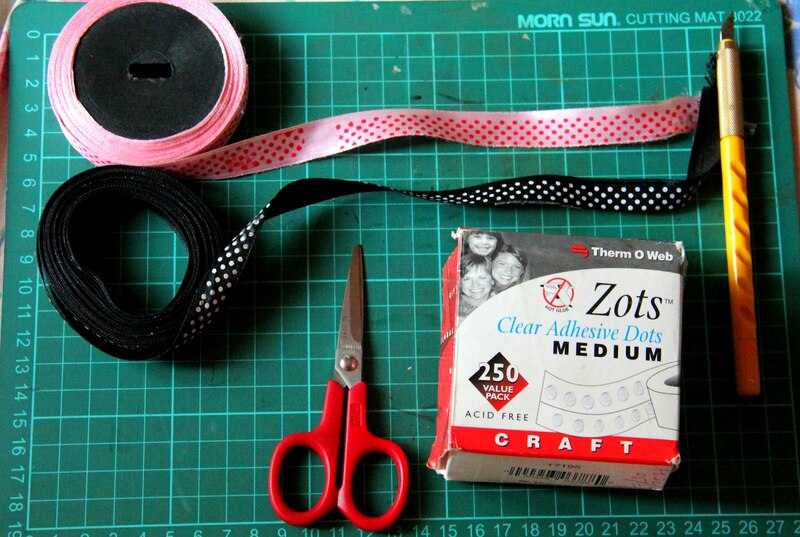 As for the other ribbons.. glue both their ends together to form a circle. Now place the other two ribbons on top of the longest one like so and tie it up with the smallest ribbon we had cut. 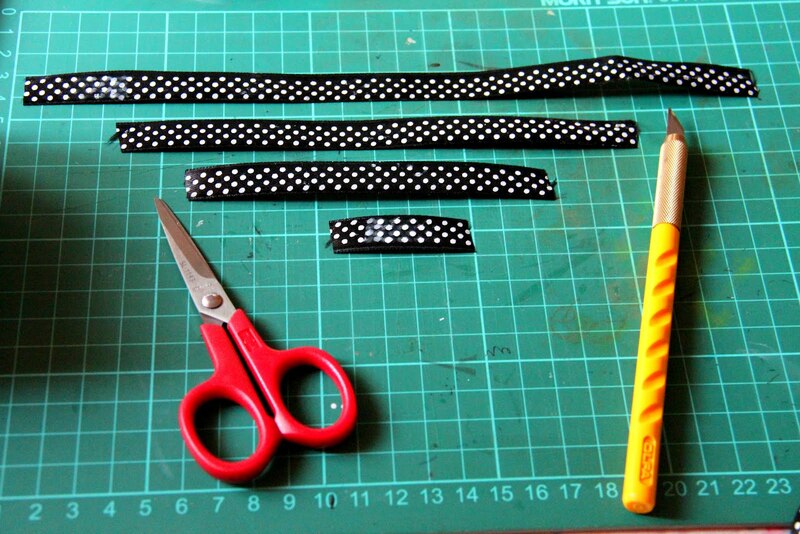 What I do is tuck one end of the ribbon underneath and secure it with a glue dot and cut off the excess. Hope you guys liked the tutorial. Until next time.. Happy crafting!! White Signo gel pen and Green glitter pen. Hello everyone!!! After a nice round up by all the talented ladies showcasing their pretty pretty work, it's now time to talk about the awesome tools that help make it all seem like a piece of cake. 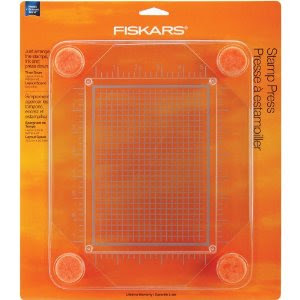 ...The Stamp Press by Fiskars. It's a wonderful addition to all the goodies I already had and it does make life easier when... wait, let me not just write about it; let me show you!! The Stamp Press (large size) is available at Lulupu - The Craft Lounge. Click here to buy it now!! And visit the store for more goodies! Thanks for visiting and hope you had a great time!! It was this birthday that my awesome bunch of craft friends gifted me a Scor Pal… and oh boy, could I be more addicted. Honestly, I am a little in awe of this product and have even wondered what was I doing without it till now!!! Scor Pal has become my must have tool in my craft kitty. It’s super slim and lightweight. It’s very very handy!!! Comes with an Instruction manual and a self secured bone folder. The 12" x 12" size of the board enables any size of the paper to fit in comfortably…. A must have feature for making envelopes and boxes, else you have to keep adjusting the paper to fit into the groves!!! Before the Scor Pal, I usually had a tough time scoring thicker card stocks as it would leave me with cracked seams… Not any more!!! Scor pal leaves you with absolutely professionally crisp lines. The score lines are ample with marking at every 1/8”, ¼”, ½”, 1” and in between markings too… The lines are deep and wide enough for the folder to fit in snugly. It’s shape ensures a comfortable hand grip and it glides through those groves on the board very smoothly. Another fun thing that I discovered by accident recently(this is what happens when u read the manual ;p) was that the top header of the Scor pal has a magnetic are to hold onto metal objects like your teeny weeny embellishments, etc thereby preventing them from getting misplaced. Here'a fun versatile Grid Background i created with the Scor Pal... it was so super quick and easy with no intricate measuring required. Here are some projects i created using the Scor Pal: Click Here, Here and Here. 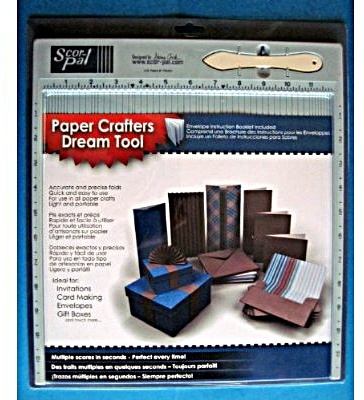 The packaging says, it’s a ‘Paper Crafter’s Dream Tool’… it truly is one!!! Just don’t think much… go ahead and grab one for yourself… you will most definitely never regret this one purchase. If You want one fr you, head over to the Lulupu Sore for this and many more mouth watering products. Am here with my first inspiration as a Lulu Pooh and my first ever video tutorial so please bare with some of my errors and mistakes ;) i promise to work on my skills and make better videos soon! I have used strip of pattern papers from the Hello Sunshine Collection by American Crafts. With the onset of summer these colours feel just perfect. 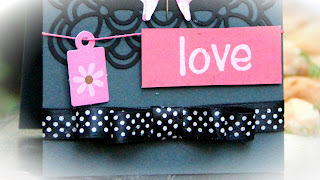 The tutorial is a guide for making an easy A2 card with left over pattern papers and border punches, a ribbon and a stamped sentiment. Here's a pic of my card. 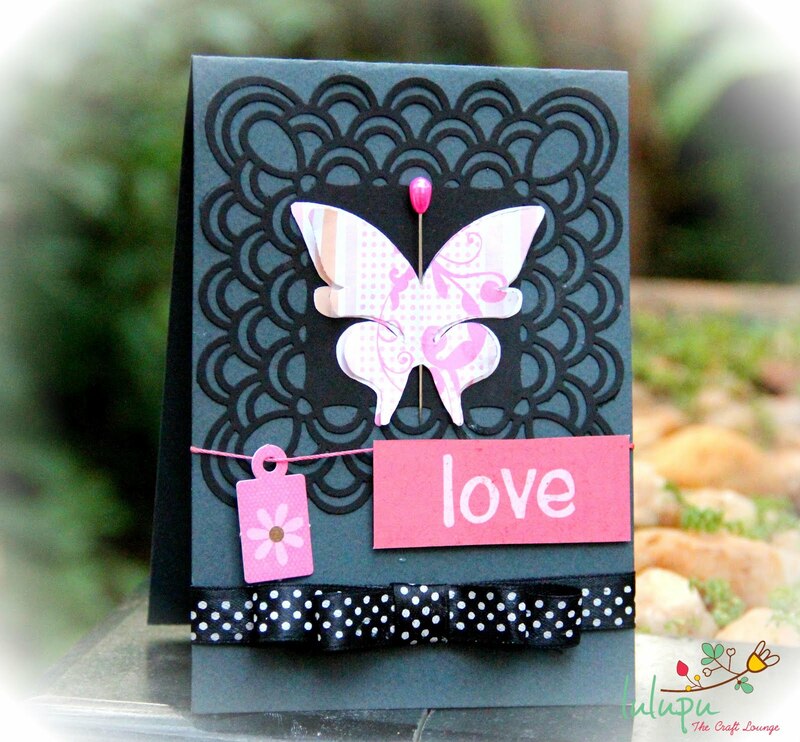 You can view the video tutorial for this card on our very own Channel Lulupu TV on Youtube! Do subscribe to get email updates or new videos! 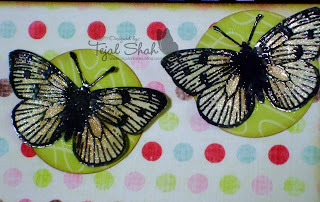 Technique Tuesday Ali Edward Clear Stamps. a very Good Morning to all of you!! Hope you guys had a fabulous Holi and played with colors to your hearts content!!! 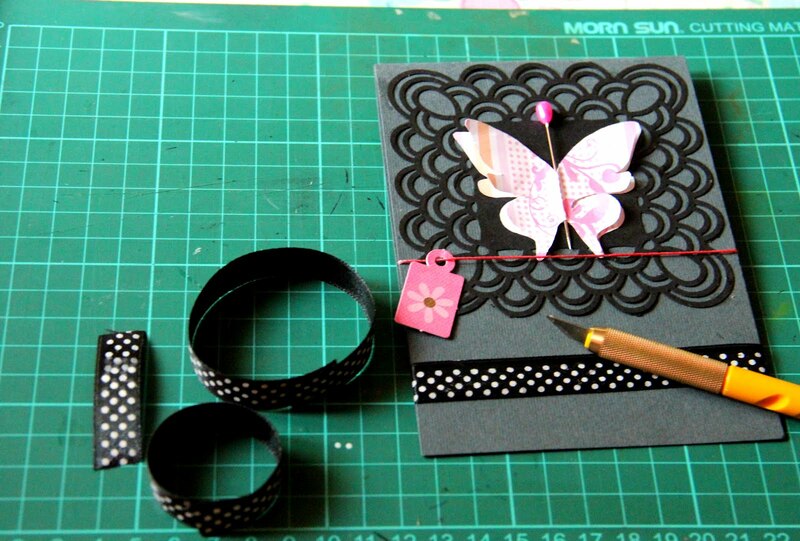 Hi, It's me Shalini and i am here with my card and my first ever tutorial!! a 12x12 cardstock, loads of pattern papers, candles, embellishments, ribbon, scissors, glue and ruler. Cut out a 12"x5.5" from your Cardstock. Score it at 3", 5 5/8", 6 3/8". I have used a Scorpal from Lulupu.com here but in can easily be done without it too using a ruler. In mine, the Layer 1 is approx. 5.5" x 3"
Layer 2 approx 4" x 3"
Layer 3 approx 1.5" x 2.75"
Stamp the image of your choice on the Layer 4/Top Layer. I added some Glossy Accents to the Balloon and set it aside to dry for a while. Now we will make the Candle Box. Cut a piece of Cardstock measuring 3 1/4" x 4 1/4". Align the shorter side(3 1/4" side) with the top of the scoring board and score at 1/2", 7/8", 2 3/8" and 2 3/4". Now, Turn the Cardstock 90degrees, aligning the bigger side(4 1/4" side) of the cardstock with the top of the scoring board. Now score at 1/2", 7/8" 3 3/8", 3 3/4". Cut the edges as shown above. Here, make sure the top of the box part is long enough for your candles. I have used these usual thin ones available locally at any store. Fold up the box, put in the candles and decorate with the ribbon of your choice. You candle box is ready. Next up we'll make the Cake. Cut a strip of Pattern paper measuring 9" x 1 1/4". Make small slits at one end... small v-shaped slits like in the picture. Fold along the thin v-shaped line so that all the v-slits bend inside. This is the base of the Cake. Cut out a circle from another Pattern Paper with diameter approx 2 1/2". (this measurement could vary depending on how big you want your cake to be.) You can use a punch if you have one or use any circle cutter. Punch holes to fix in candles. You could make as many as your number of candles. I made 8 here. This is something that i did to ensure uniform punches on the front. The pic on the right is the back side of my circle. I made vertical cross cutting equi-distant lines and then a small circle with about 2" diameter. 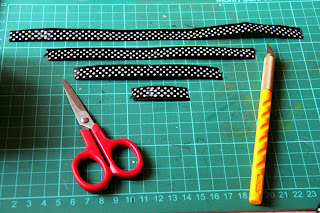 Roll the strip of Pattern Paper made in Step 9 and stick the edges to form a circle with the exact diameter as the circle cut in Step 10. Stick the rolled strip to the bottom of the circle. Assemble the card. Embellish with your choice of buttons, laces, swirls, pearls, punch outs, etc. Add a strip of Ribbon each in the center of both the ends of the Card. This will help you in tyeing the ends together so that the Card can be posted easily. we will be happy to answer them!!! Fancy Pants Adorable Wishful Thinking Double-Sided Paper 12"x12"
Journal Cards - Life is Good Double Sided Card Stock 12"x12"
Scor-Pal Measuring and Scoring Board 12"x12"
Glossy Accents, PB Party Time Clear Stamp, Paper Smooches Word Up, Momento Ink, MS Loop Punch, Laces, Ribbons, Pearls, 3-D Glitter, Rhinestones.